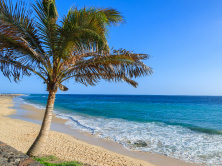 If you are planning a Canary Island holiday, the following information may help by giving you an overview on the Canary Islands and the 8 islands which make up the archipelago. Bathed in glorious sunshine throughout the year, enchanting Canary Island holidays never fail to seduce. Dramatic volcanic landscapes blend with the lush tropical forests, great swathes of sugar cane and banana plantations. 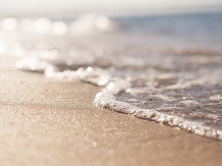 Sandy beaches fringing deep blue waters bask in the warmth of the African sun, tempered by cooling Atlantic breezes to ensure that the living is easy. The Canary Islands have so much to offer from smart modern hotels, first class watersports and energetic, to tranquil havens of natural beauty. Tenerife is not only the largest of the Canary Islands, it also offers more sights, attractions, towns and cities to explore, and more contrasts than any of the other islands. Where else can you visit a banana plantation and then drive up a mountain tipped with snow? Lanzarote is a dry and fairly flat island whose bizarre landscape has been shaped by volcanic activity. However, there are regions of green hills and sandy beaches giving Lanzarote is reputation as an island of visual impact. Second largest of the Canary Islands, Fuerteventura is arid and desert-like, although is perhaps most famous for its beaches with over 50km of stunning white and golden sand making this island and ideal choice for the beach lover. 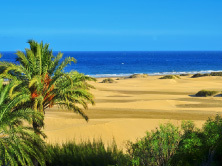 Most people go on a holiday to Gran Canaria for its abundant sunshine and golden beaches and head for the resorts of Playa del Ingles, Maspalomas and Puerto Rico. As for nightlife, there’s a huge choice and clubs, pubs, cabarets and casinos to satisfy everyone. 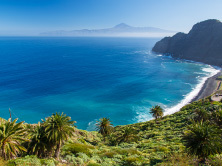 You will be astonished at what the stunning island of La Gomera has to offer! From valleys laden with produce, elegant palm groves and pockets of pines. A peaceful island – ideal for unwinding and just a stone’s throw from its neighbour, Tenerife. 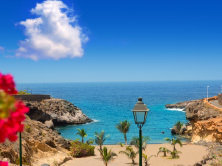 Not to be confused with Las Palmas [the capital of Gran Canaria], La Palma is one of the three smaller Canary Islands and is also known as La Isla Bonita [the pretty island], and La Isla Verde [the green island]. Beautiful it certainly is! Due to the absence of sandy beaches, the island of El Hierro has escaped the holiday tourist invasion experienced by other islands. Superb pine forests, sheer mountains walls and fantastic outlook points are just part of its appeal. La Graciosa is one of the Canary Island’s best kept secrets, with its stunning beaches of soft, pale sand and crystal clear waters with barely a soul to be seen anywhere. La Graciosa is recommended for the ultimate stress-busting break – even for a day’s excursion. When it comes to sunshine, the Canary Islands have an eternal spring-summer climate and are a year-round holiday destination; you can take your pick when to go. The winter months [December to March] are slightly cooler but still paradise compared to mainland Europe, the UK and most of North America. In fact, winter is the Canary Islands busiest period. 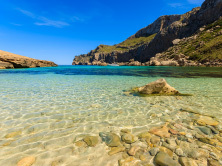 The summer months [July to September] are also “high season” mainly because that is when mainland Spaniards choose to go there on their annual holiday. Carnival season [February/March] is a popular period for a Canary Islands holiday, when anyone and everyone decides to take part in the fun. For maximum value on airfares and accommodation, the best periods to travel are from November to mid-December and better still, April and June [with the exception of Easter]. It is very difficult to sum up the people and traditions of the various Canary Islands as expressions, mannerisms, food, architecture and music and significantly different from island to island and rivalries [in particular between Tenerife and Gran Canaria] are strong. Soon after the 1982 electoral victory of the socialists at national level, the Canary Islands were declared a ‘comunidad autónoma, one of the 17 autonomous regions across Spain. A few local Canarios would like to see their islands become completed autonomous! The regions flag is a yellow, blue and white tricolour, to which the few militant ‘independentistas add seven stars to represent the islands. The archipelagos division into 2 provinces, Tenerife and Gran Canaria, remain intact as well as the rivaly between the 2 islands – so much so that the regional government has offices in both capitals, which alternate as lead city of the region every 4 years. The term ‘Canario designates all of the islanders. However, it once referred more strictly to the people of Gran Canaria along [now more readily referred to a Grancanarios or Canariones]. The people of Tenerife are Tinerfeños; those of Lanzarote are Conejeros. People of Fuerteventura are Major Eros [from the Guanche name for much of the island – Maxorata]; those from La Gomera – Gomeros; La Palma – Palmeros; and lastly El Hierro – Herreños. The ancient inhabitants of the Canary Islands were known as the Guanches from the words ‘guan [meaning ‘man] and ‘che [meaning ‘white-mountain], referring to the snow-capped Teide volcano in Tenerife. According to Spanish historical records, the Guanches were tall, strongly built, blue-eyes and blond haired. Their origins and date of arrival on the islands is still unknown, as is the language they spoke. They worshipped Abor – a powerful god who could bring rain and stop the flow of lava. Their tools and weapons were produced from roughly cut wood, stone and bone. They lived in natural caves or grottos carved into the rocks. Caves also serviced as granaries and as places of worship, and were also used to bury the dead. You don’t have to be on a Canary Islands holiday very long before you notice the astonishing variety of volcanic rock – all scattered about, blasted out of the earths surface by the countless eruptions that have rocked the archipelago over its history. Along with other Atlantic islands, such as Madeira, the Azores and Cape Verde islands, the Canary Islands are of volcanic origin. They emerged from the sea millions of years ago. Lanzarote and Fuerteventura are believed to be the oldest at between 16-20 million years old, with Gran Canaria, Tenerife and La Gomera appearing around 8-13 million years ago. The remaining islands are much younger. You will notice on your Canary Islands holiday that the flora is unique. 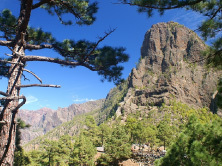 La Gomera is home to a rare ancient forest that is now a UNESCO world heritage site. More than half of the islands 1,800 species are indigenous, and the unusual character has long attracted the attention of botanists. One of the most unusual plants in the Canary Islands is the dragon tree [Dracaena draco], which can reach 18m in height and live for centuries. Its shape resembles a giant posy of flowers, its trunk and branches being the stems, which break into bunches of long, narrow, silvery-green leaves higher up. As the plant grows, it becomes more and more top-heavy and in order to stabilise itself it grows roots on the outside of its trunk and eventually creates a second, wider trunk. What makes the plant stranger still is its red sap or resin – known as dragons blood – which was traditionally used in medicine. 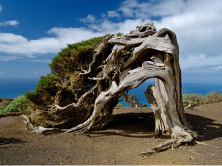 The plant once played an important role in Canary Island life as it was beneath the ancient branches that the Guanche Council or Nobles would gather to administer justice. Despite the Canary Islands position on the edge of the tropics, its waters are relatively cold. This explains the lack of coral reefs which would normally occur at such latitudes. However, the sea conditions are congenial to many species of fish, mammal and seaweed; these include whales and dolphins, shoals of small cardinal fish, huge crabs, parrot fish, conger and moray eel, and tiny seahorses. A Canary Island holiday provides very attractive diving grounds. Beginners can gain experience while more advanced divers can explore the underwater caves off Gran Canaria, La Palma and El Hierro and the coral reefs near Lanzarote. The water is at its clearest between November and February. The people of the Canary Islands are enthusiastic about keeping alive their strongly rooted tradition of local handicrafts. These include embroidery, lace-making, basket-weaving, ceramics and woodcarving. Different islands specialise in particular crafts. La Gomera is known for its basket ware and pottery that is made without the use of a wheel, while Tenerife is also a centre for traditional, Guanche-style pots. El Hierro produces beautiful woven rugs and the town of Ingenio in Gran Canaria, produces some of the best embroidery in the islands. Hours of Sunshine : the islands differ considerably in their daily hours of sunshine. 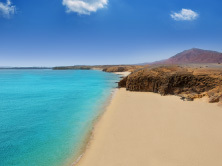 A Lanzarote holiday and Fuerteventura holiday enjoy about 12 hours of sunshine per day in August. The northern part of Tenerife and Gran Canaria can sometimes be cloudy, while the southern regions of the islands bask in sunshine. Rainfall : The average monthly rainfall in the Canary Islands rarely exceeds 50mm [2 inches]. La Palma and La Gomera holidays have the highest rainfall, Lanzarote and Fuerteventura the lowest. The rain is more frequent in Tenerife and Gran Canaria, particularly on the northern shores of the islands. Temperature : The chart shows the average maximum monthly temperature. The mild climate of the Canary Islands produces average temperatures of between 18°C in the winter and 24°C in the summer months.